The British Union flag is one of the most uniquely designed flags in the world, and has gone through some changes throughout history. 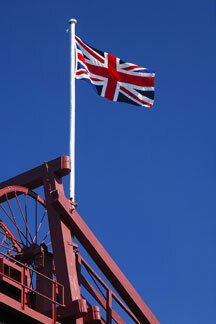 The first Union flag was flown in 1603, when King James of Scotland also became the King of England. While England and Scotland had their own flags, and still do to this day, the Union flag represented the union between the two countries, and comprised the English cross of St. George with the Scottish cross of St. Andrew. The flag was designated a maritime flag, which allowed it to be flown on British ships. 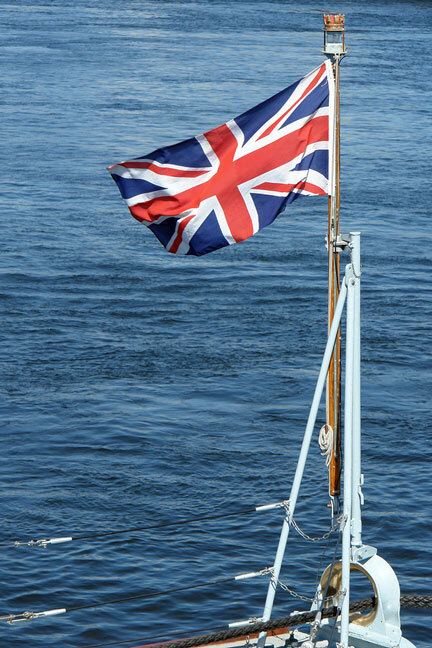 When flown at the bowsprit of British naval ships, the flag was called a jack, and the British flag nickname of "Union Jack" is derived from this usage. In 1801, the cross of St. Patrick was added to the flag when Ireland joined the Union. This cross was counterchanged with the cross of St. Andrew. While Ireland's south broke away from the Union in 1921, the flag remains the same. The Union flag is not a national flag, but is officially a royal maritime flag. 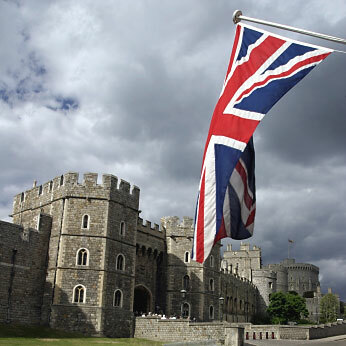 This means that British citizens who want to fly the Union flag on land must get royal permission before they do so. Shown below are the three flags — the English Cross of St. George flag, the Scottish Cross of St. Andrew flag, and the Irish Cross of St. Patrick flag — from which the British Union flag is derived. The United Kingdom, which comprises England, Scotland, Wales, Northern Ireland, and several islands, is located in Northwestern Europe. The country shares one border with the Irish Republic, but is otherwise separated from Europe by the North Sea and the English Channel. The population of the United Kingdom is close to 40 million, the capital is London, and the official languages are English and Welsh. The United Kingdom has a mild, but frequently changing, climate. While the entire country is known for rain, it is generally rainier in the west than in the east. In addition, the north tends to be slightly colder than the south. The United Kingdom leads the European Union when it comes to energy resources, relying on significant oil and gas reserves located in both the North Sea and north Atlantic. Other areas that contribute to the United Kingdom's economy are the pharmaceutical, defense, and financial services industries, as well as high-tech industries such as biotechnology and telecommunications. The United Kingdom joined the United Nations in 1945, and has historically played a major role in world conflicts. An ally of the United States, the United Kingdom backed the USA's War on Terror and the invasion of Iraq in 2003. The United Kingdom is a major tourist destination, and with more than 23 million visitors per year ranks as the sixth most highly visited country in the world. In fact, the country's tourism industry is so large that it employs many citizens and contributes significantly to the economy. The nation's capital of London, with its historic architecture, renowned art galleries, and famous theater remains one of the most oft-visited areas. Oxford, Cambridge, York, and Shakespeare's Stratford-Upon-Avon, are very popular, as is the Highlands region of Scotland. The most frequent visitors come from France, Germany, and North America. 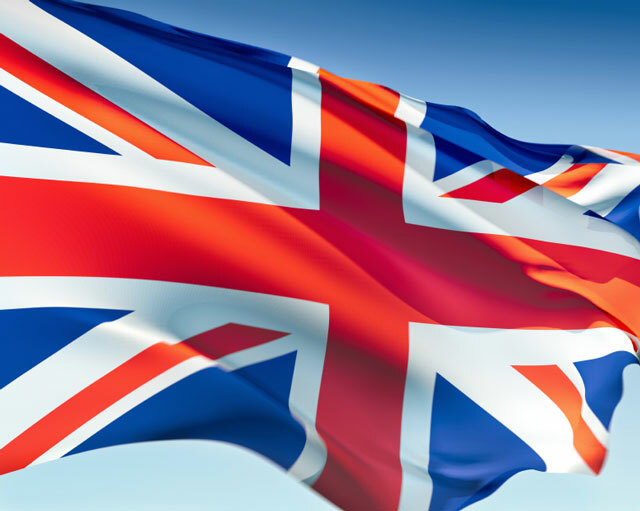 UK Facts - information about the United Kingdom and its flag. UK Government - official United Kingdom government website. UK Map - United Kingdom maps, geography, and tourism. United Kingdom News - UK news articles and facts.